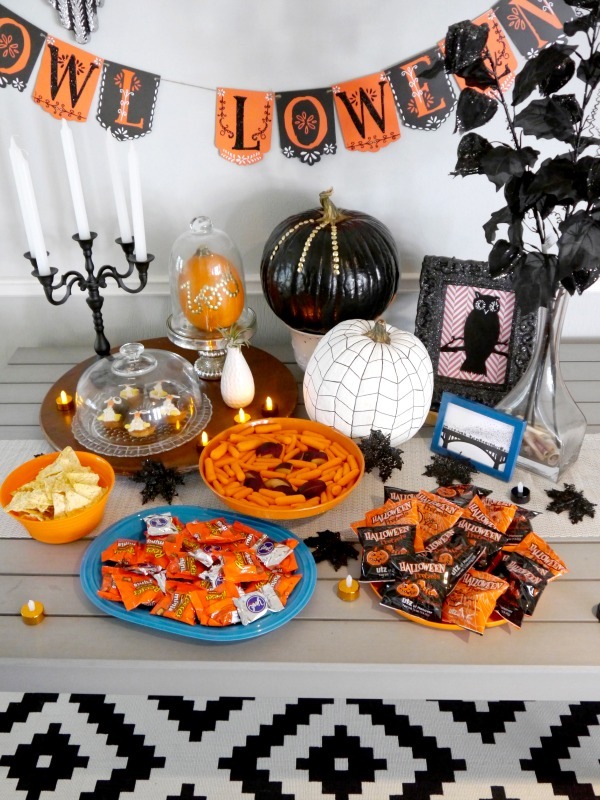 Halloween party decor - C.R.A.F.T. Note: This post is sponsored by World Market, but all opinions are my own. Y’all know I love a good cheesy saying. I went nuts last Valentine’s Day, remember? Well, I’m happy to announce that the cheese is back… Happy Owl-loween, friends! How cute is that?! 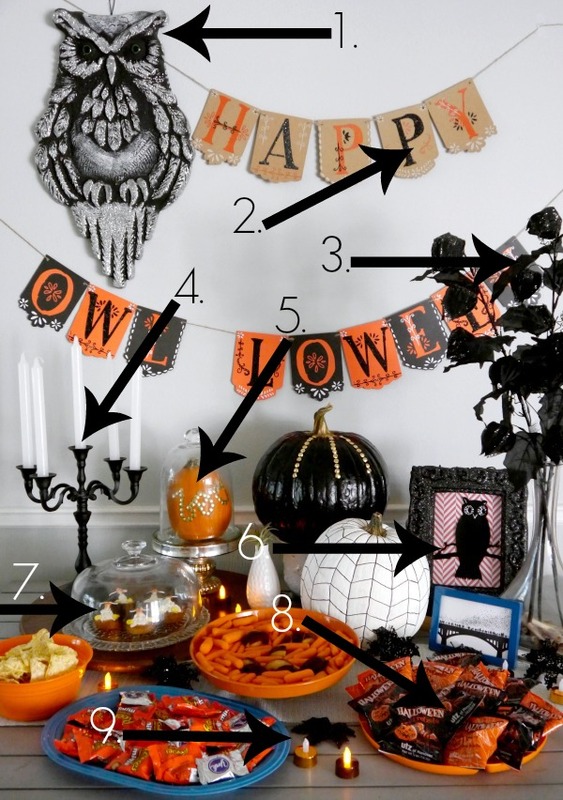 I teamed up with World Market to bring y’all some Halloween party ideas based on the Owl-loween theme I brewed up! Here’s the cuteness all in one picture, but don’t worry I’ll give you the close ups and over share all of the owl deets and crafts below. 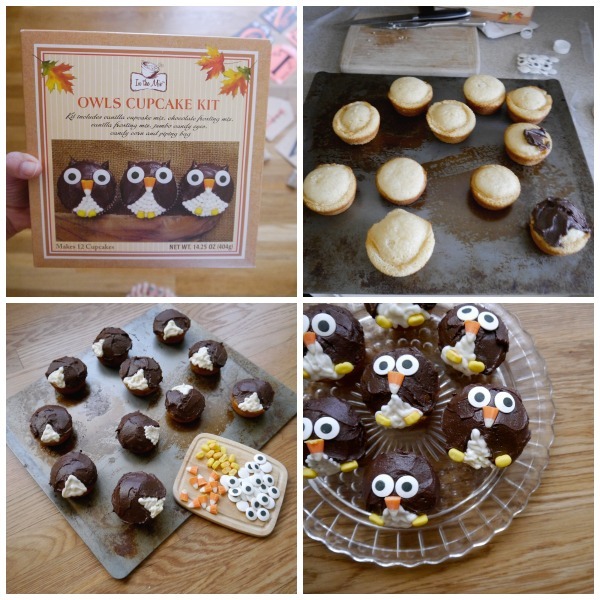 Let’s start with these owl cupcakes that I made all by myself! I’m very proud, as you know baking is not my forte. And just for the record, they tasted delicious! The kit comes from World Market with everything you need minus butter, powdered sugar, water and milk. All of which I already had on hand! It was a Halloween miracle. The kit comes with a piping bag and tells you exactly what to do, promise. Are you so impressed with me right now?! The only bad thing I did was forget to add the ears, but they’re still super cute even earless, right? 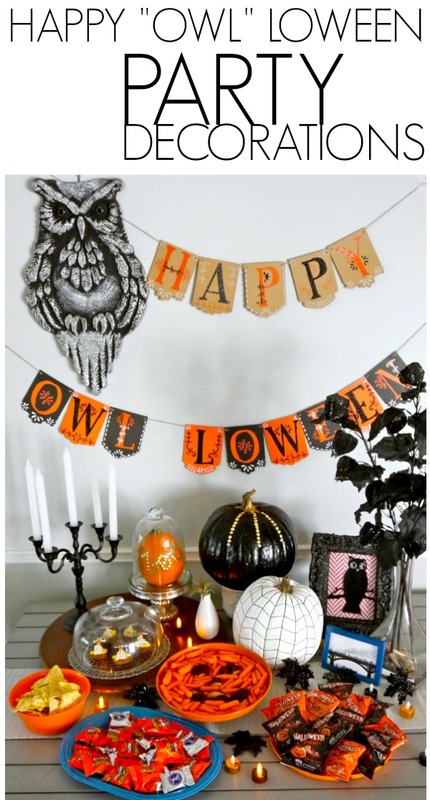 To make the Happy “Owl” loween sign I bought 2 of these Halloween banner kits. I decided not to use the skeletons that come with the package. 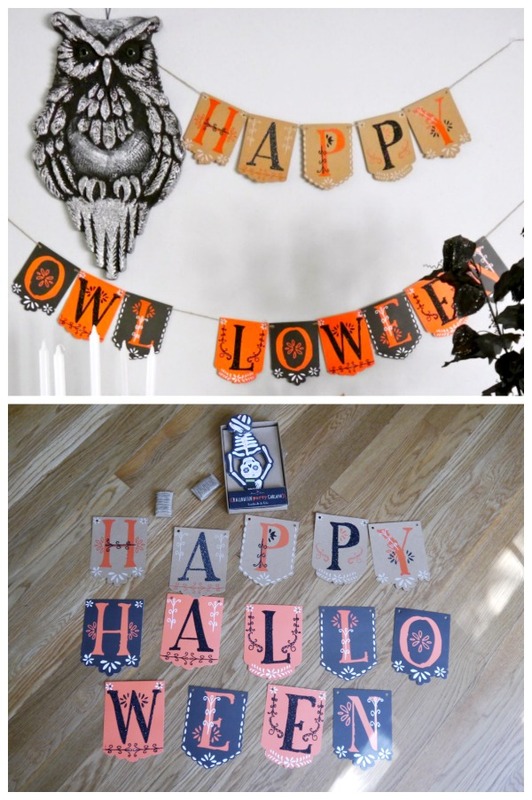 The packs come with twine, but the letters are not strung together yet, so it was perfect to just steal 2 letters from the 2nd package and string together my Happy “Owl” loween garland! I love the giant sparkly owl. He’s made out of styrofoam, so it’s super light, and really easy to hang. I hung him up with a tack. You can’t really tell, but he’s 26 inches tall! I might need another for my front door. 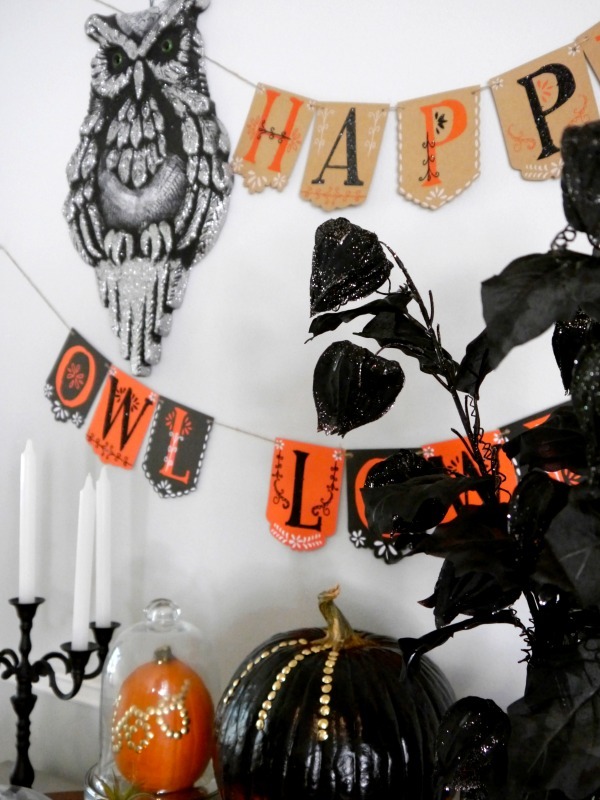 Oh and I did one other little craft for my Happy “Owl” loween theme. 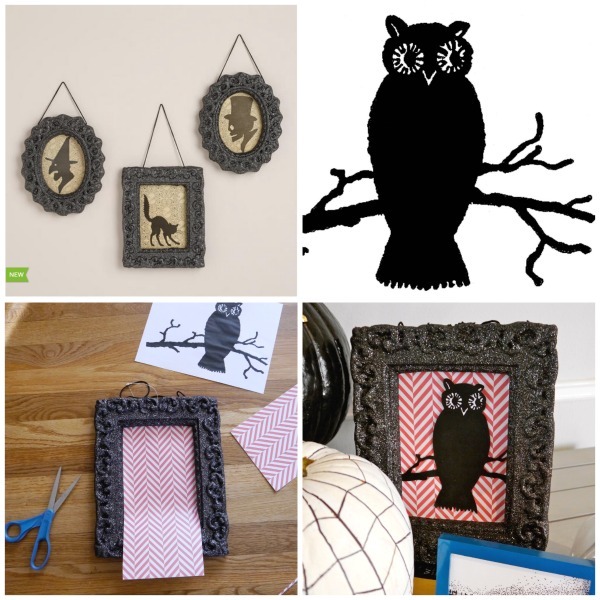 See the sparkly gold frame with the owl? It started off as a Silhouette of a cat from World Market! I used this owl clip art and some scrap book paper to give the frame a quick makeover to fit my theme! Here’s a close up of the owl silhouette. 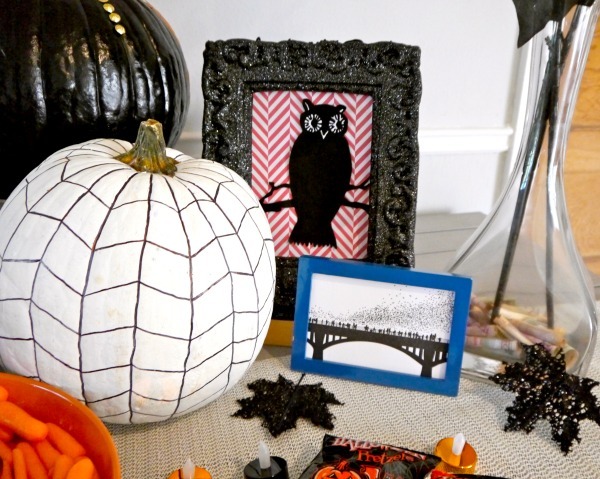 Oh and here’s the no carve spider web pumpkin tutorial. The turquoise frame is from World Market too, I stole it from my Halloween mantle. I wanted to make sure I added something healthy to Halloween party table, so I came up with this pumpkin tray of carrots and plums. I’m in a big plum phase right now, might be due to this little announcement. 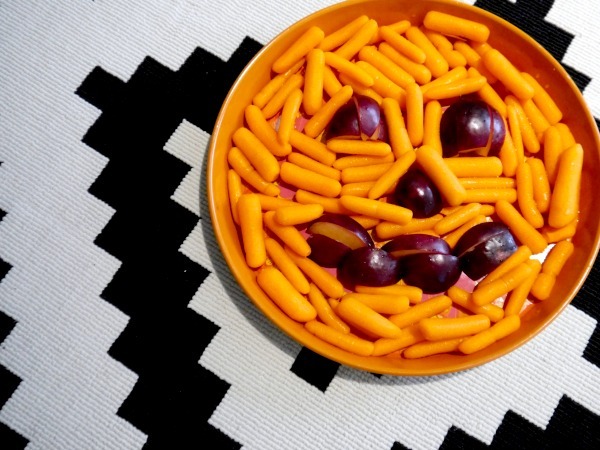 Here are more healthy Halloween snack ideas. Here’s a close up of the candelabra, glass cloche, and my owl cupcake masterpieces! I’m kind of obsessed with my new glass cloche. 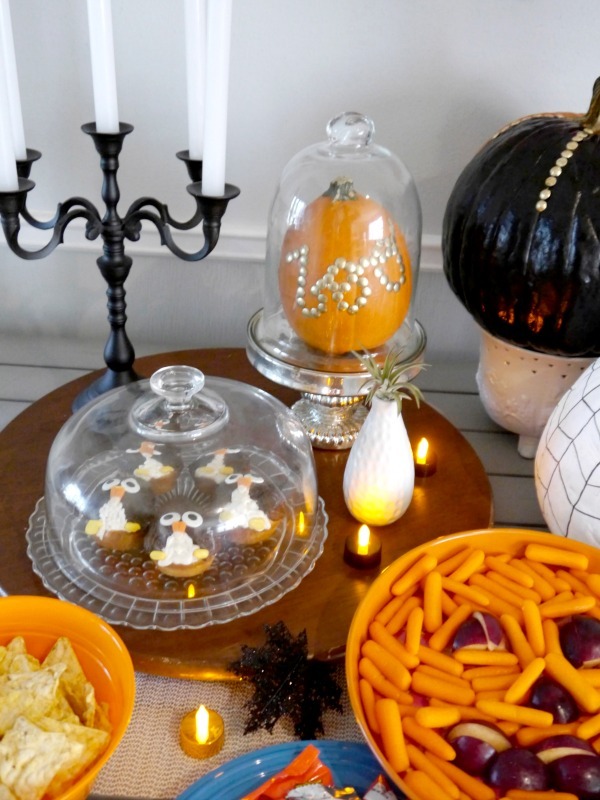 Psst… Check out two of fave blog friends Halloween World Market posts: a vintage mantle by Lolly Jane and tips for throwing a Halloween kids party at Capturing Joy! Love your owl cupcakes, and also see that Congress Bridge with bats on it. Mine is hanging in my office;) What a cute set up! 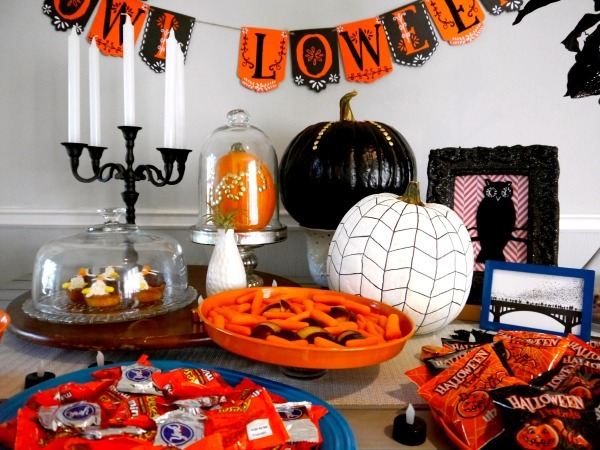 So many incredible Halloween diy ideas that I must try. Jamie! You said you had made cupcakes, so naturally, I had to check them out. Girl, you’ve got skills! This whole set up just goes together perfectly. I’m so glad I could meet you at BBC. Your blog is so fun!